The Coconut Beach Resort Denarau ferry route connects Tavewa Island with Fiji. Currently there is just the 1 ferry company operating this ferry service, Awesome Adventures Fiji. The crossing operates up to 7 times each week with sailing durations from around 4 hours 15 minutes. Coconut Beach Resort Denarau sailing durations and frequency may vary from season to season so we’d advise doing a live check to get the most up to date information. Found on the southern tip of Tavewa Island, one of the many landmasses that form the Yasawa Islands archipelago off the coast of Fiji, is the Coconut Beach Resort. 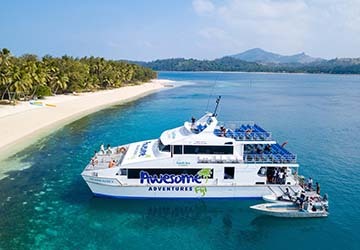 Seven weekly sailings leave the tropical island getaway to the mainland port of Denarau with the Awesome Adventures Fiji service taking just over four hours. What is there to do at Coconut Beach Resort? Once the site of a Copra plantation for the production of coconut oil, the island is now a holiday resort of largely unspoiled natural beauty. The resort is settled amongst the coconut groves with long stretches of golden beaches curving around the coastline. It gives the perfect view of the world famous Blue Lagoon and is bursting with verdant palm forests, teeming with tropical wildlife, rise inland on gentle hills. The crystalline Pacific waters provide an idyllic setting and an abundance of exotic marine life for scuba diving and deep sea fishing. How do I get around the resort? What services run from the resort? Currently only one service operates from the port in Coconut Beach. An Awesome Adventures Fiji line sails south to the port of Denarau on the Fijian mainland, a short catamaran trip that whisks passengers across the silver surface of the warm South Pacific Ocean. The service has seven weekly sailings with journey taking just over four hours.